California is picture perfect from palm tree lined coastline and surfers at sunset to selfies with Disney characters, historic buildings and the iconic Golden Gate Bridge. The highlights and photo opportunities are endless and you’ll want to remember your favourite Golden State moment, so grab your camera and get exploring with our top 10 most photogenic urban highlights in California! This pretty, up market beach town near San Diego pronounced la-hoy-yah is a nice escape from the hustle and bustle of the city with boutique shops, cool brunch stops and beautiful sandy beaches. For photography brainstorming visit Brockton Villa for brunch, perched above La Jolla Cove it overlooks the Pacific Ocean. Get the shot: Rugged coastline and beautiful beaches make for fantastic photo opportunities, surfing is a way of life in California so a photo of this iconic Californian pastime must be caught on camera. 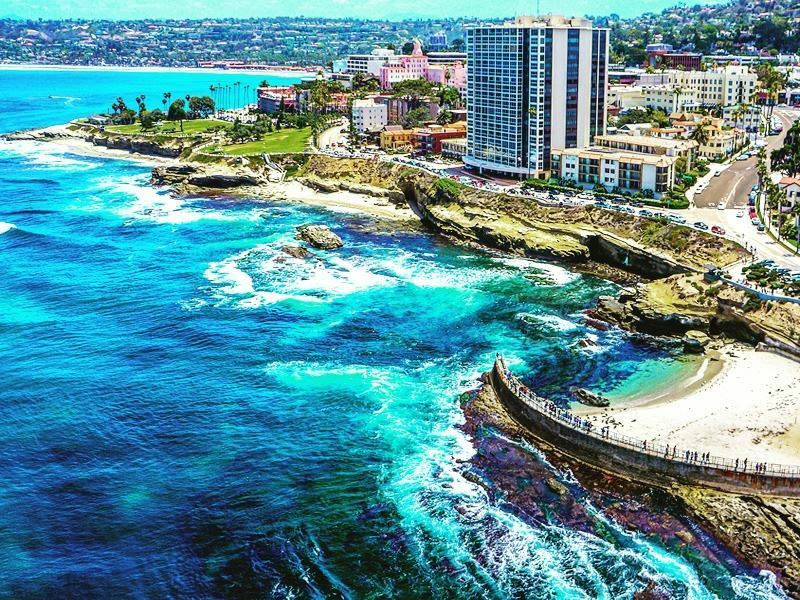 There are plenty of renowned beach breaks here; La Jolla Shores, Windansea Beach and Black’s Beach are well known for waves. Windansea and Blacks are not recommended for novices so this means you’ll be able to capture some local pros in action. Don’t miss the sea lions at Children’s Pool; lounging on the shoreline they have made this beach their home, the ability to get up close to these gorgeous creatures makes for a fantastic photo. Head to nearby La Jolla Cove to capture the sun setting over the Pacific on camera. Pelicans are another Californian resident to look out for, snap of they gliding low over the ocean. Home to the government of California this grand building was constructed in 1860. 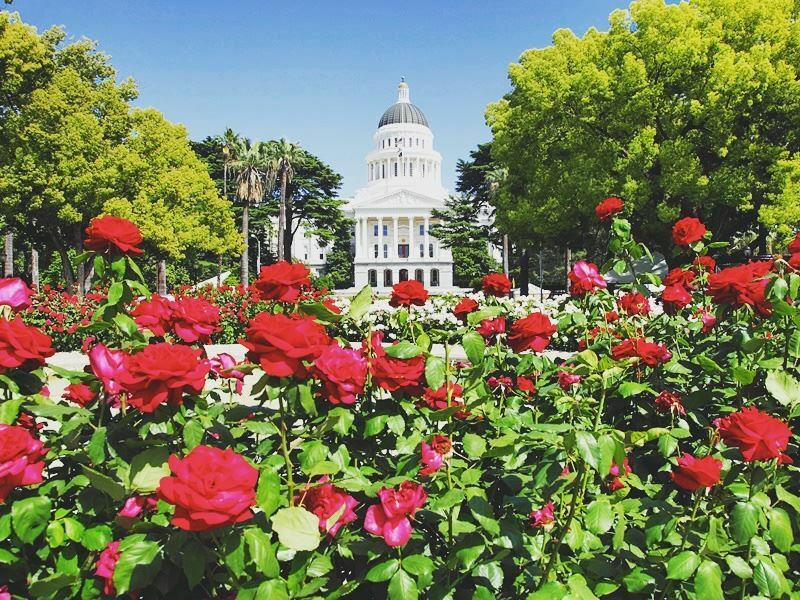 Art exhibits, a flag collection and daily free tours of the legislative chambers and offices are a fantastic way to learn about the history of California’s governing body. There are also public viewing galleries, so if bills are being debated then it is possible to witness this taking place. Get the shot: Granite archways and columns a dome shaped roof all in gleaming white, this is architecture at its finest and all angles of this building are magnificent to capture on camera. It’s easy to choose a spot to photograph this historic landmark, the 40 acre Capitol Park is a good place to start. The International World Peace Rose Garden and water fountain are a good spot as placing them in the foreground will add interest to your image; it is also impressive to photograph at night. 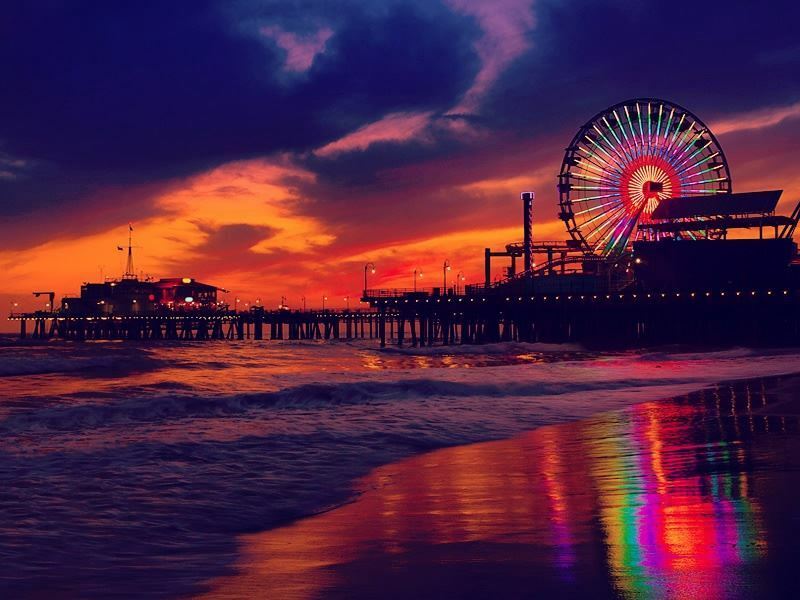 Santa Monica is famous for its laid back beach vibes and iconic pier, just along the coast from Los Angeles you’ll see locals up at dawn practicing yoga on the shoreline and a palm lined beach promenade with chic beach house in gorgeous pastel colours. With so many photo opportunities it’s hard to know where to start. Hire a bike and cycle along the Marvin Braude Beach Trail or as the locals call it ‘The Strand’. This beach path meanders for 22 miles in total and is a great way to see Santa Monica. Leading right under the pier, get inspired, stop and capture the coast on camera as you go. Don’t miss Muscle Beach, right next to the pier the outdoor gym is well worth a stop for people watching. Another cool photo to add to your collection has to be an image of the lifeguard huts lining the golden shorelines. Get the shot: There is nothing quite like watching a Californian sunset and Santa Monica is the place to do it. From the pier or sat on the beach watch as the colours change from dusky pinks to vibrant oranges and as the pier and Ferris wheel lights up in the darkness the photo opportunities become endless. For a birds eye view and a completely different angle climb aboard the Ferris wheel and take photos as you ride this famous Californian landmark. 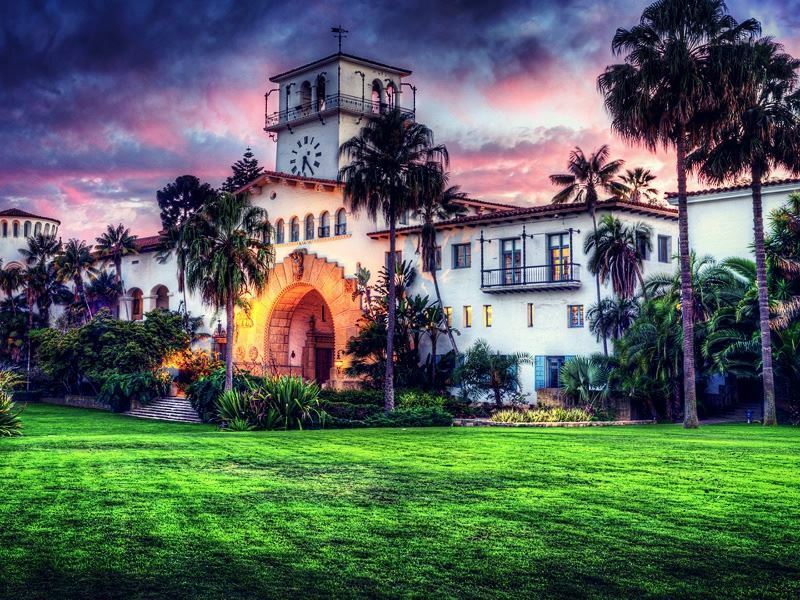 Although a trip to a courthouse would not normally be at the top of the holiday list, the Santa Barbara Courthouse is worth breaking the usual holiday itinerary mould for. Stroll around the charming grounds and explore the grand interior on a tour of this 19th century beauty. An earthquake in 1925 destroyed the original 1872 courthouse and this beautiful Spanish Colonial Revival style building was constructed on the same grounds in 1929. Terracotta roof tiles and white washed walls give a lovely Spanish feel. Another historic buildings in Santa Barbara worth a visit is the Old Mission, founded in 1786, today as well as a tourist attraction it also serves as a parish church. Get the shot: The view from the sunken garden of the building and clock tower is a great place for photos and a shot of the main entrance will really show the size of the ornate tower and façade off. Take a lift to the top of the El Mirador clock tower at 85ft high there’s a fantastic birds eye view of the buildings, Santa Barbara and the ocean. 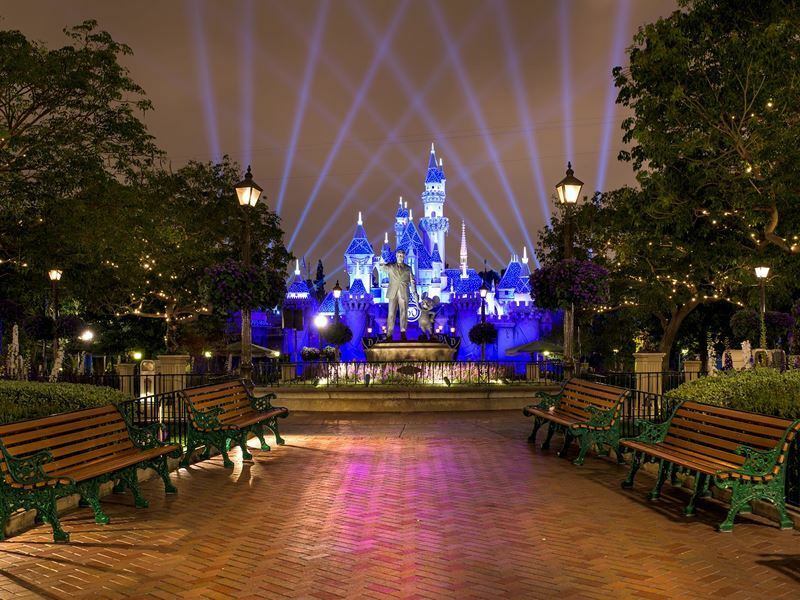 Disneyland needs no introduction, open 365 days of the year this spectacular all American pleasureland is a must visit. For the full Disney experience stay at a Disney hotel and dine at a Disney restaurant. Ride the legendary space mountain. Scream on the Twilight Zone Tower of Terror, take a boat journey on the quirky “it’s a small world” ride and don’t miss Pirates of the Caribbean; at a duration of 17 minutes it’s the longest ride in Disneyland. Round off the day with the fireworks and Fantasmic! Show and get some really memorable photos of your adventures here. Get the shot: Scour the park for Disney characters, stroll along Buena Vista Street to spot Mickey, Minnie, Goofy and many more for some very special selfies. For a selfie with Frozen characters, Olaf can be found in Hollywood Land and grab a princess selfie with Anna and Elsa. The selfie opportunities with famous Disney characters here are endless. Palm Springs was once the playground of the Rat Pack and is well known for its mid-century modern architecture. This unusual desert dwelling in the Coachella Valley is around 130 miles northeast of San Diego. Retro houses, boutique shops and its own walk of stars make this a top tourist destination. Golf has a huge following here too with over 100 courses, it’s a mecca for golf enthusiasts. Get the shot: You can’t go far in this city without spotting ‘Desert Modernism’. This style of architecture is well known for homes designed with large windows, flat roofs and open plan living. 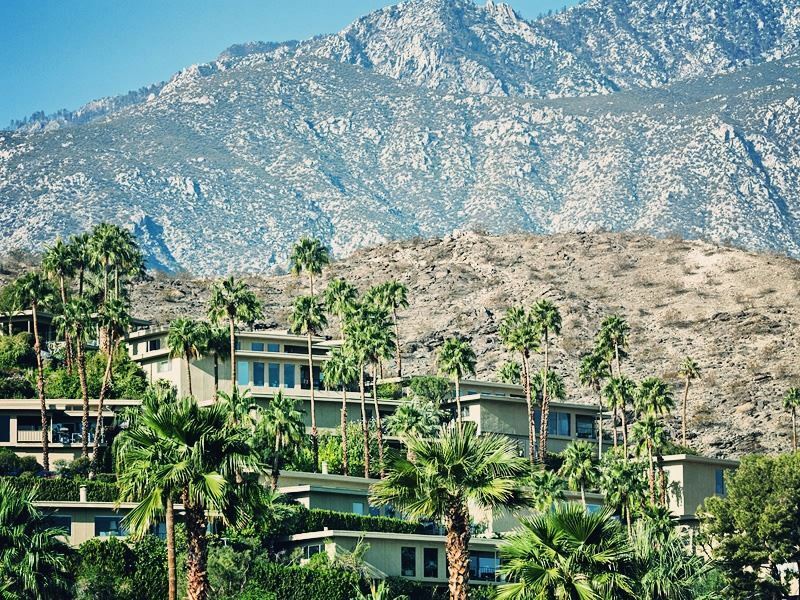 Have your camera ready on a guided tour of Palm Springs, learn more about this fascinating style and see the most interesting buildings in the desert or plan your trip around the Annual Modernism Week. Held in February it celebrates all things mid century modern with tours of homes, lectures and plenty of parties. Look out for the once homes of Frank Sinatra and Bob Hope, definitely ones to capture on camera. Venice Beach is 7 miles north of Los Angeles airport and an awesome place to capture California at its finest and weirdest! Get the shot: Base yourself on the boardwalk and take a few moments to watch the world go by, flanked by the ocean and lined with palm trees this is the essence of California. Bronzed bodies zoom by on roller-skates, showing off their moves as they go, this is definitely the iconic image to get here. Make everyone jealous with a beach selfie next to a lifeguard station or take a stand-alone shot of a station and the beach for a really memorable image. 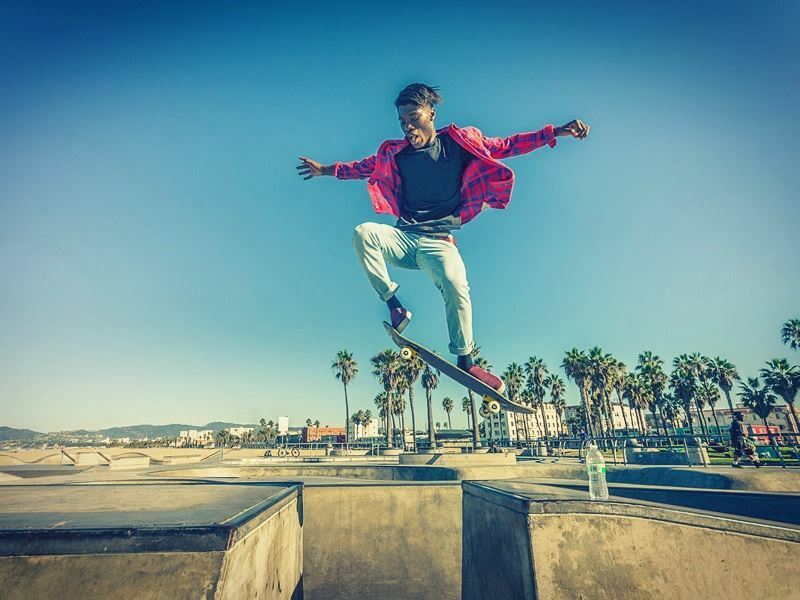 Venice Skate Park is right on the shoreline, two concrete bowls, a street section with stairs and rails and a snake run make this a legendary place to skate. Watch and snap away as local pros kick flip, ollie and jump. The drum circle on Sunday afternoons at the beach is a random weekly gathering worth checking out, capture locals dancing and drumming from midday until nightfall. Balboa Park has 1,200 acres and is home to San Diego Zoo, botanical gardens, 14 museums, water features, numerous sports complexes and a huge variety of eateries. It is an urban park like no other. The Botanical Building with Reflection Pond is one of the many spots within the park you’ll want to snap up. 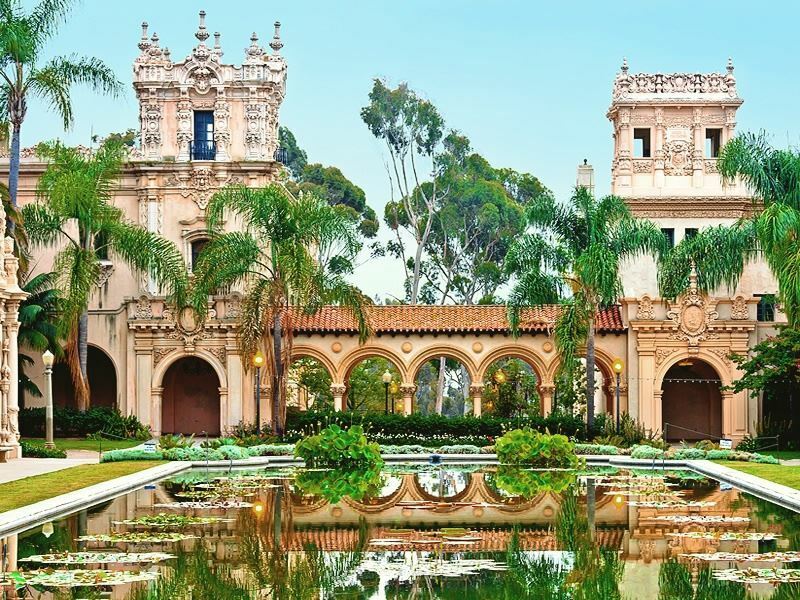 Get the shot: Casa de Balboa can be found on El Prado, this historic Spanish building was first built in 1915 for the Panama-California Exposition and was reconstructed and reopened in 1982. This stunning building is full of beautiful architecture. Each side of the building is worth photographing with beautiful archways and carvings full of intricate detail. There are so many different angles to capture this building from whether it be focusing on a close up shot of the beautiful detail on the facade or a shot further away with the lily pond reflecting the buildings ornate archways. It’s pretty impressive in low light too. Inside Casa de Balboa is home to restaurant Casa 1915, the San Diego History Center, the Museum of Photographic Arts and the Model Railroad Museum. So take your time to discover both the outside and inside of this magnificent structure. 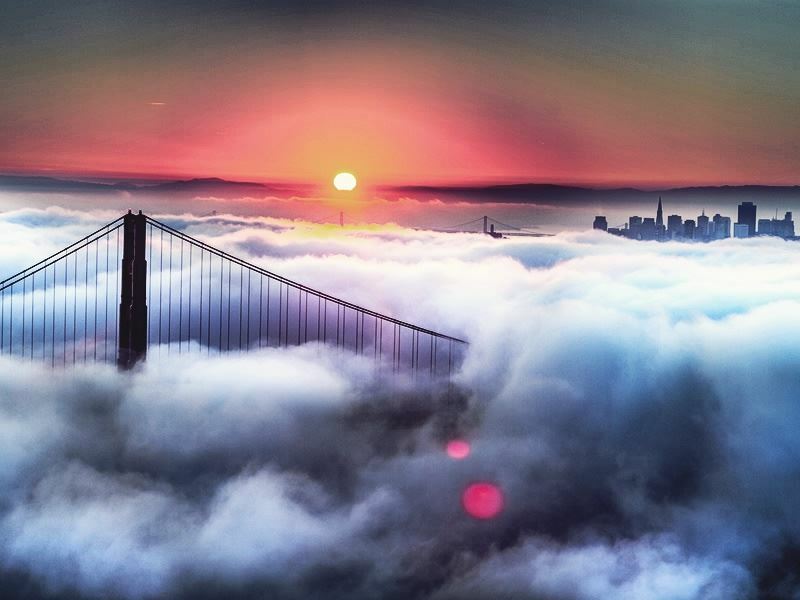 Golden Gate Bridge has to be San Francisco’s most iconic landmark. Well known for its ‘international orange’ paintwork the suspension bridge connects San Francisco with Marin County. At nearly two miles long and 220 feet above the water it is a sight not to be missed, it consists of six lanes and opened in 1937. Get the shot: You can get a cool shot of this landmark whatever the weather, be it on a beautiful clear day with boats sailing by in the foreground, or in fog with just the tips of the towers jutting out through the mist; it can be quite a dramatic image. There are plenty of viewpoints to capture the perfect photo. Fort Point parking lot is beneath the bridge; here you can get creative with your photos and capture the bridge from a completely different angle. Southeast Golden Gate Bridge parking lot is another great spot to get panoramic views of this beautiful landmark. Both parking spots are on the San Francisco side. Be sure to drive, cycle or walk over the bridge to Vista Point on the Marin County side, it has awesome views of the bridge looking back towards San Francisco. After nailing the shot visit Sausalito for brunch, this quaint ocean-side town looks back over the water towards San Francisco and Alcatraz, it’s a lovely place to have a stroll and take more photos. Other San Francisco photographic highlights include San Francisco’s cable cars, stop by one of the turntables at Market and Powell Streets for some great photo opportunities or capture them buzzing up and down one of the many steep hills within the city. The Transamerica Pyramid, San Francisco’s tallest skyscraper is another must photograph, its unusual pyramid shape makes it an intriguing building to capture on camera. Los Angeles is home to the rich and famous and a fabulous place to capture some very memorable holiday images. 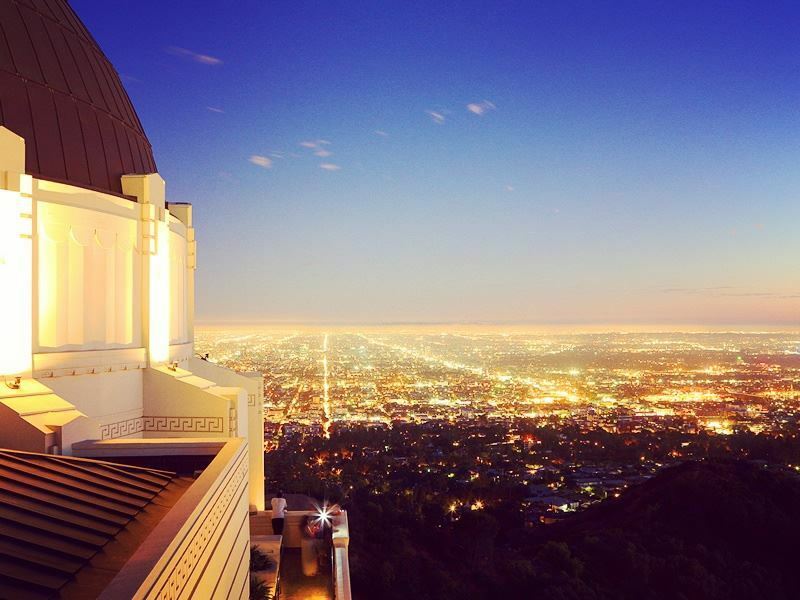 After a visit to the exciting tourist spots in LA head to Griffith Park. 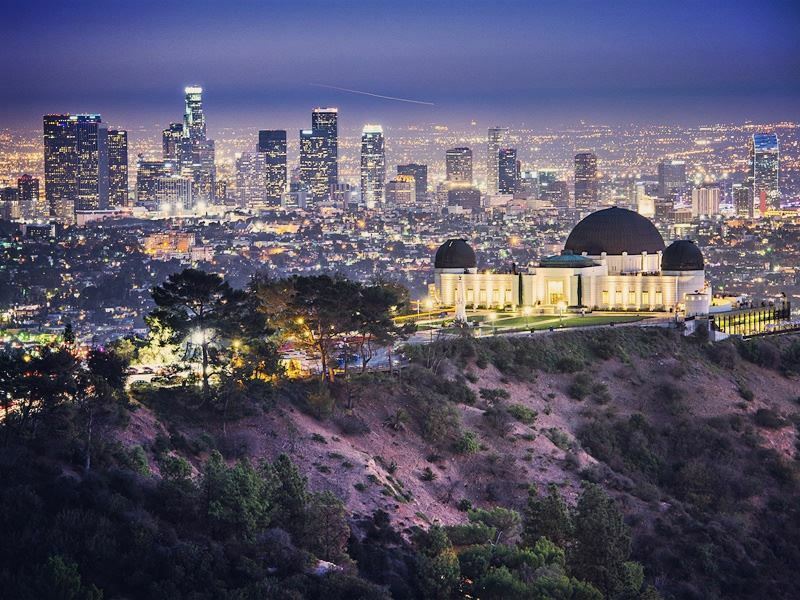 Its 4,310 acres make way for a ton of hiking trails, Los Angeles Zoo and Botanical Gardens, the Hollywood sign and the Griffith Observatory, which has to be the crowning jewel of the park. Get the shot: This spectacular art deco structure is huge and finished off with three large domes and stands proudly above downtown LA. After you’ve sourced the best spot for capturing the building on camera with free admission it is well worth going inside to watch a planetarium show and to stroll around the interesting exhibits. Make your friends jealous by posting online an impressive photo of the Hollywood sign; a viewing platform at the observatory is one of two areas in the park to see it from. Not only that but there are awesome views of the downtown Los Angeles skyline and the Pacific Ocean. It's well worth a trip up here at night to really capture the essence of LA’s urban skyline. The twinkling buildings make for a striking image.